Dental hygiene, and in particular the use of the small toothbrush called in Arabic siwak or miswak, was the subject of a number of monographs. The toothbrushes were made from the wood of the arak tree (Salvadora persica L.), and recent scientific studes indicate that this particular wood is effective in preventing plaque and inflammation of the gums. The use of the siwak was common in pre-Islamic Arabia, and the Prophet Muhammad advocated its frequent use to cleanse the mouth. References to its use are found in classical Arabic poetry and literature as well as in medical writings. For the role of the siwak/miswak in medieval Islamic society as well as dental care, see Gerrit Bos, "The Miswak, an Aspect of Dental Care in Islam", Medical History, vol. 37 (1993), pp. 68-79; and Vardit Rispler-Chaim, "The Siwak: A Medieval Islamic Contribution to Dental Care", Journal of the Royal Asiatic Society, ser. 3, vol. 2 (1992), pp. 13-20. 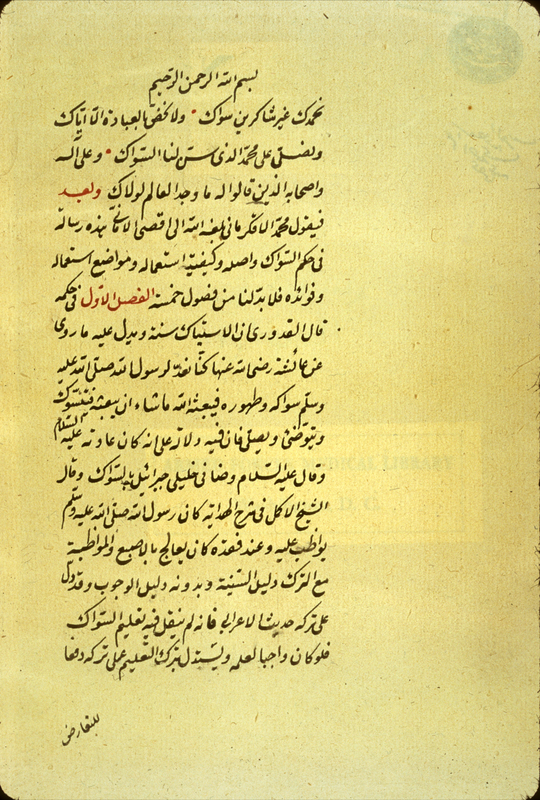 NLM has only one treatise dealing specifically with dental hygiene, and that is a unique copy of a treatise on the proper regimen with the toothbrush (siwak) written by Muḥammad al-Āqkirmānī, probably in the mid-18th century. No other copy is recorded. For a general bibliography of Arabic writings concerning dental hygiene, see Ullmann, Medizin, pp. 25-216. A small tract on the use and the social, physical and religious benefits of the toothbrush (siwak) was composed by one Muḥammad al-Āqkirmānī and preserved in a unique copy at NLM. Muḥammad al-Āqkirmānī was probably the encyclopedist of that name who flourished in the middle of the 18th century. See GAL vol. 2, p. 604 (454) and GAL-S, vol. 2, p. 674. No other copy is recorded. The opening of an Arabic essay on the use of the toothbrush (siwak) written by Muḥammad al-Āqkirmānī in the mid-18th century. No other copy is recorded. The copy is undated, probably 18th century. Arabic. 4 leaves (fols. 1b-4b). Dimensions 20.5 x 12.8 (text area 14 x 5.7) cm; 19 lines per page. The title is given on fol. 1b line 6 as Risalah fi hukm al-siwak. The author's name given on line 5 of fol. 1b as Muḥammad al-Āqkirmānī. The copy is undated and unsigned. The appearance of the paper, ink, and script suggests of date of the 18th century. The copy appears to be complete. 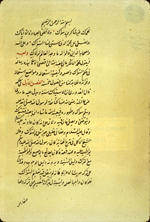 The text is written in medium-small, careful ta‘liq script, black ink with headings in red and with red overlinings. The text area is frame-ruled. There are catchwords. There are some marginal annotations, possibly in the same hand as the unnamed copyist. The volume consists of 4 leaves. Fol. 1a is blank except for an owner's stamp and signature for al-Sayyid Muḥammad ‘Aṭā’ Allāh and one signature for another owner. The beige glossy paper has horizontal laid lines, single chain lines, and is watermarked. The volume is bound in a brown leather binding with gold borders. There are paper pastedowns. A former owner, al-Sayyid Muḥammad ‘Aṭā’ Allāh, has placed a stamp and his signature on fol. 1a, and there is a second owner's signature (illegible) on the same folio. There is no further information on its provenance or when it came into the collection of NLM. It was not included in Schullian/Sommer catalogue.